His ability to take the ball early made Andre special. 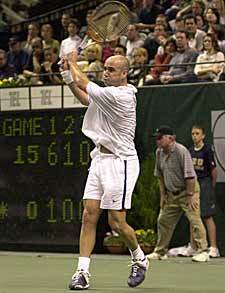 When Andre arrived at the academy he was going on 13 and he already had a big forehand. Naturally we continued to develop it (see part 1). But I also worked very hard and long on his backhand. Why? With the two hands and with his hand and eye coordination, I saw Andre had the ability to pick up the ball early off the ground and especially on the service return. I thought if we succeeded in bringing his backhand up to the level of his forehand, we'd have somebody special. Turns out I was right. Watch the variety Andre has on that side. He'll hit four or five crosscourt backhands with a good arc going over the net, about 3-5 feet. Then he'll make the ball dance. He'll step in and make Sampras back up. All of sudden he'll hit the backhand down the line for a winner, or run around it and hit a winner with an inside out or inside in forehand. Andre holds a continental with his right hand, the left is between an eastern and a semi-western. For my money, Andre has flat out the best two-hander in the pro game, maybe the best backhand period. Using this magnificent high speed footage developed by John Yandell for Advanced Tennis Research, I want to show you how we built his backhand from the ground up. There are a lot of different grips top players use on the two-handed backhand. For Andre, with his right hand, or bottom hand, he holds a very solid continental. It could even be a touch towards the eastern backhand grip. But the top hand is what makes Andre so good. His grip there is between a semi-western and an eastern. He's not underneath the handle the way Jim Currier was. And he's not all the way up on top either. If the top hand rotates too far toward a continental grip, then the top hand becomes dormant, it can't work. Andre has the perfect combination. 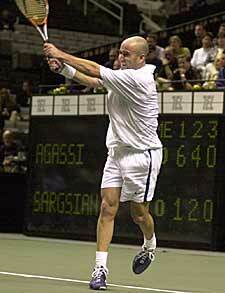 As you look at him hitting his two handed backhand, watch his left hand work - that's the key to Andre Agassi. I can remember Andre playing for hours and challenging everybody at the academy, telling them he could beat them with his left hand. Watch Andre's preparation. I mean he prepares so beautifully. The ball leaves the opponent's racquet and the preparation starts. The racquet is quite low, with a backswing that starts back straight and then moves into a very compact loop. But what isn't as well understood about his preparation is the way he sets up his base. Watch his base on contact. It's at least shoulder width-sometimes one and a half, up to twice that wide. Remember, the closer your feet are together the more wobbly your base is going to be. Watch how solid Andre's base is. This is true no matter what stance he hits from. In the modern game you have to be able to hit equally well from three different stances: a neutral stance where you step into the line of the shot, an open stance without a step, and also, a closed stance in which you step across with the front foot. Watch how Andre's legs work, particularly in the open stance. Watch how his hips and shoulders turn and look how low he gets. 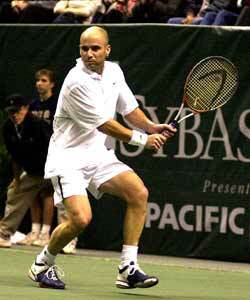 Watch the left hand work--the key to Andre Agassi's backhand. Andre's swing pattern is very simple. He has a tremendous hip and shoulder turn. He takes his racquet back a little lower than many players such as Martina Hingis, for example. Notice his arms are fairly close to the body on the back swing. 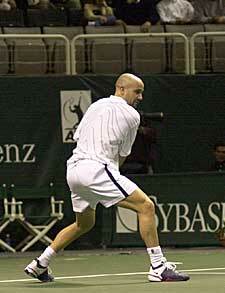 The backswing is very short and this allows him to adjust his racquet head depending on the difficulty of the ball. This is one of the reasons he is able to hit so many balls on the rise. It also allows for his fantastic variety. Andre can drive ball. He can extend his arms out and make contact with the racquet head basically at the level of the ball. Or, he can drop the racquet head underneath, hit the angles, dip the ball on the net rusher, or hit that fantastic lob. When Andre hits the ball on the rise he stands on the baseline or inside the baseline. Notice how he keeps his legs still on difficult balls. Andre's beautiful preparation - tremendous body turn, compact backswing, arms close to the body. 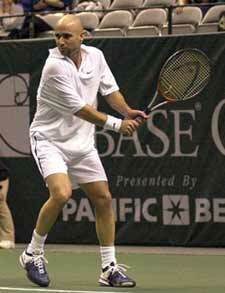 In pro tennis there are certain types of finishes depending on the kind of shot. If Andre wants to drive the ball, he'll send his arms out towards the target a little bit more. You'll see the arms straighten out and extend. If he wants a little bit more spin you'll see that the racquet will come back toward the right shoulder a little bit more, and his arms will be more bent. When Andre hits, watch the left foot. It takes an extra step and pushes him off for the recovery. That's key! To drive the ball, Andre will straighten out his arms and extend. When he hits with more topspin the arms stay more bent. Hitting the ball is one thing, but remember the opponent's going to get it back too, so you've got to be able to recover. That's one place my thinking has changed over the years. Watch the left leg keep moving and push off to start the recovery. I used to feel that it was important to stay completely still through the hit-not anymore. In today's game the recovery starts much earlier. As Andre's going to the ball, he doesn't hold that left foot back. Watch what happens. It hits the ground and then pushes off to start the recovery. Quite often if you keep the back foot behind you, you will raise up too quickly and also hit a lot of your shots with just your arms. Especially when you are running wide, you can't stop your feet. See how the natural flow of Andre's motion, can take him an extra step or two. Experiment with your own recovery step and you might end up getting to the next ball faster and getting a lot more balls back-just like Andre Agassi. Learn more about the Bollistic Backhand, and the other great videos from Nick in this series.